As Aruba pushes ahead with its full sustainability project, it is not only focusing on industry and businesses. Smart Community Aruba is a 20-unit planned residential complex that will encapsulate the spirit of innovation that the island hopes will drive it towards a 100-percent green future. Utilities Aruba describes the project as a living lab, where sustainable ideas can find a practical application while their viability is assessed. In February 2014, several parties involved in the enterprise signed an agreement confirming their contribution. As well as representatives of the government of Aruba, Utilities Aruba, WEB N.V., ELMAR N.V., national telecommunications company SETAR and the public housing agency FCCA were also present, as was the independent Dutch research and development institute TNO, which has been operating in Aruba since 2011. Through real-life testing and demonstration, Smart Community Aruba will involve its residents in moving applied sustainable technologies from concepts to practical application. The key objective is knowledge development relating to scalable technology solutions and business models to help make Aruba’s transition to sustainable energy a reality. Land has already been cleared for this living lab in Kibaima, in the centre of the island, and the project is scheduled to be completed by the spring of 2015. 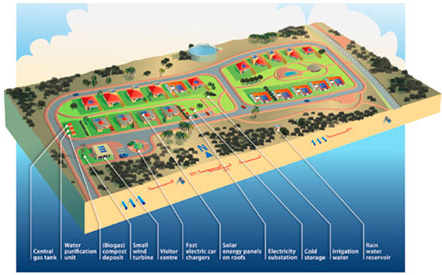 The main objectives of the planned neighbourhood include gaining valuable experience in the integration of renewable energy into the smart grid, where the island’s 5,000 hours of wind and 2,000 hours of sun per year will be an enormous asset. Smart Community Aruba will also see the evaluation of sustainable construction techniques and efficiency measures, as well as research into improving water and waste management techniques. A large part of the project will focus on the demand side, with the eco-neighbourhood also aiming to generate important data about consumer behaviour. Once knowledge and experience is gained from this Smart Community project, Utilities Aruba will be introducing these results into the more than 40,000 other homes on the island. Aruba hopes that this kind of project will have not just environmental repercussions but also substantial economic ones, fomenting a knowledge-based economy and taking the emphasis off Aruba’s relatively large tourism industry. With the island’s very particular geographic and climatic features forming the context for this real-life experiment, those involved hope that it will be an attractive prospect for private investors who wish to test sustainability-related products, and Aruba is an ideal setting for showcasing their solutions. “However, it is also a challenging test environment due to the harsh climatic conditions including high speed winds, high UV factor and salt corrosion. A successful performance on Aruba will therefore be a real seal of quality and future selling point,” says Carlos Tapias, financial analyst of Utilities Aruba N.V. and member of the committee of Smart Community Aruba. There is also scope for private investors to take part in the scheme by sponsoring experiments, showcasing their own technology or testing and certifying technology. Partnerships can be developed on a project basis. A series of concrete experiments focusing on both supply- and demand-side sustainability have been planned for Smart Community Aruba. The obvious areas of solar and wind power performance and reliability are among them, but so too are power storage solutions that seek to boost energy grid stability as well as building designs, retrofitting strategies and electric transportation. The areas of water and waste management will also see various innovative tests, such as decentralised water purification, water production through wastewater treatment and biogas production. With only 20 homes, Smart Community Aruba will be relatively small, but Utilities Aruba, the government and the other stakeholders hope its successes can be exported elsewhere on a larger scale. While Aruba is contemplating becoming a springboard for technology between Europe and the Americas, it is also seeking to push the boundaries of sustainable innovation, and the expectations is that many will look to this small island for inspiration.